Posted in Brunch, on December 19th, 2018. Every December a group of girlfriends get together for breakfast at one of our homes. It was my turn. 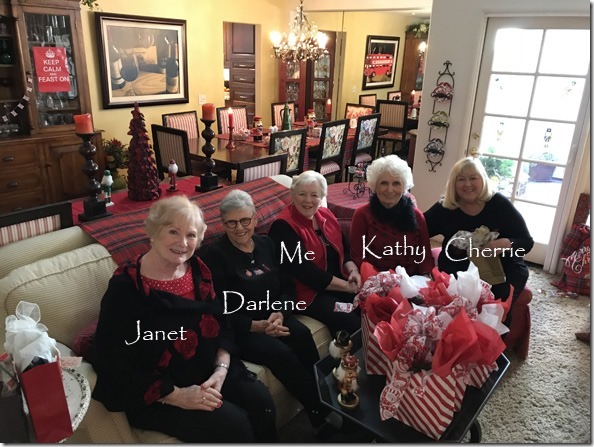 The rest of the year, every couple of weeks, we meet at a Corner Bakery and catch up with our lives, our children, grandchildren, our dogs and cats, our travels, our reading and just general “life.” We’ve been meeting for about 35 years. Since we meet quite early, I needed to make something that I could complete likkety-split. This seemed like a good recipe to make that happen. First you begin with a sheet of defrosted puff pastry. It is rolled out a little bit more than it is as it comes in the box, but didn’t require much to get it to an 8×10 size. Onto the baking sheet it went. With a sharp knife you score a line all around the outside edge of the puff pastry – this allows the edge to rise up (and kind of become a ridge/rim so the filling doesn’t leak out). Then I mixed up some crème fraiche and a bunch of grated Gruyere cheese. 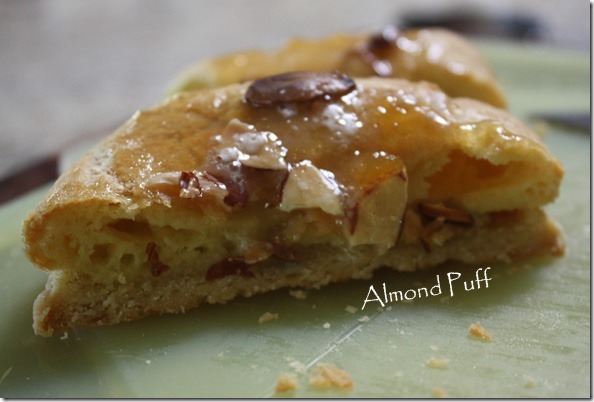 That was spread all over the interior of the puff pastry. Into a hot oven it went for about 14 minutes. I waited until all of my friends were here before I put this in the oven. When it came out of the oven at that point the filling part was golden brown all over and smelled lovely! Onto the top I placed about 4-5 slices of already crisped bacon, cut into little pieces, then I cracked 3 eggs. 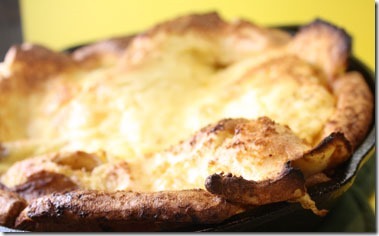 At this point you time it carefully – 7-10 minutes back in the oven to make the eggs sunny-side up. At 7 minutes the whites were still not cooked. At 9 minutes they were done, maybe even over-done. Then you use a knife to cut kind of irregular pieces, giving each person a bunch of the pastry/bacon part and one egg. Oh, I hadn’t sprinkled the top with chives when I snapped the photo. There’s a photo after I’d cracked the eggs onto the tart. One yolk broke and it wasn’t very pretty (I ate that one). If I did this again, I’d probably try to get 4 eggs onto the piece – the recipe said it fed 4, but you only put 3 eggs onto the sheet. Strange. I’ve adjusted the recipe below for that. I’d recommend large or even medium eggs and do try to get 4 onto the tart. 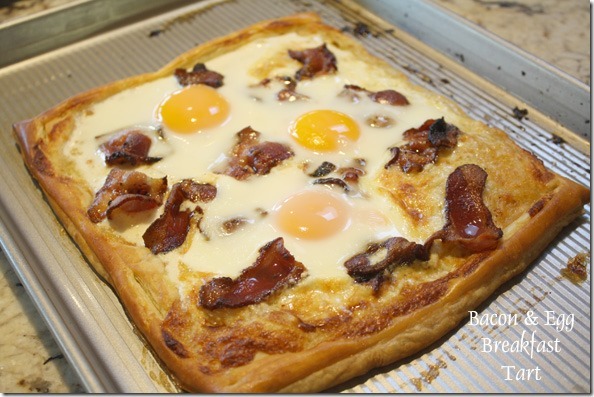 I made both sheets of puff pastry and then had 6 eggs altogether – should have done 8. 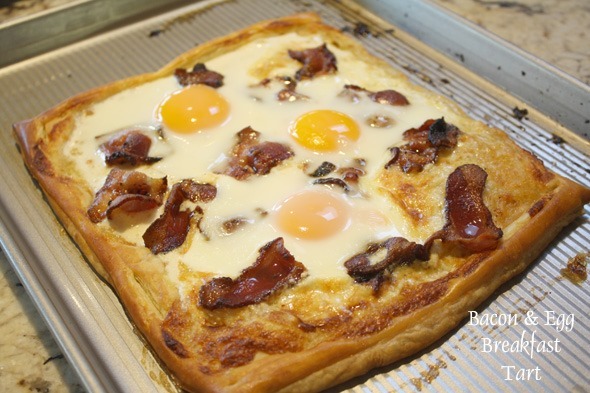 And no, I didn’t eat any of the puff pastry – I ate the egg and bacon only and got some of the cheesy mixture too underneath the eggs. All the guests enjoyed it. The cheese added just a great flavor to the whole tart. 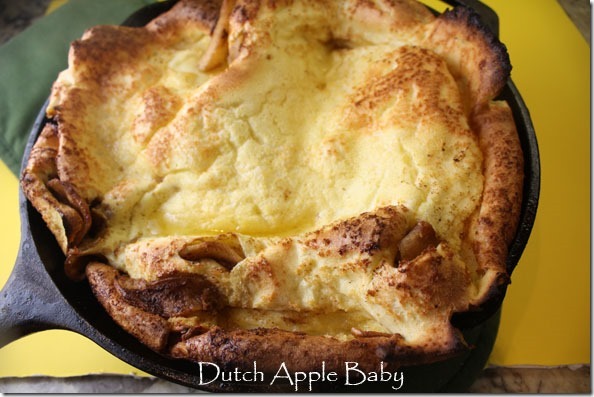 This could be something you’d make on Christmas morning. Grate the cheese the night before and mix it up with the crème fraiche. You could even do the bacon the day before too. Then it’s just a matter of rolling out the pastry, chilling it for 15 minutes, it said, then you put the toppings on and bake. 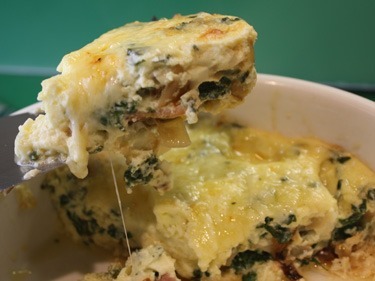 The other thing I would do – making this again – I have 2 ovens – I would have used both, because even with switching the 2 pans halfway through and turning them around, one sheet didn’t cook up as nicely golden brown. What’s GOOD: easy to make, really. Lovely presentation. It looked better once I had the chives sprinkled all over the top. 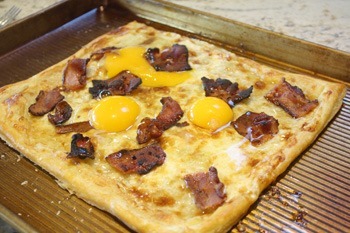 Some of my guests didn’t eat the egg yolk, but they ate everything else around it and the pastry. I served this with fresh fruit (blueberries, raspberries and blackberries) and I had some slices of Dario’s Olive Oil Cake with Rosemary and Pine Nuts in the freezer, and since it’s not a very sweet cake, I thought it would work well with the breakfast. It did. I served mimosas and hot coffee. What’s NOT: nothing really, except planning ahead to defrost the puff pastry for 24 hours before making this. And don’t use extra large eggs – even medium eggs would be good. I used large. Watch the eggs carefully during the 7-10 minute cooking time. Mine went from not done at 7 minutes to over-done at 9 minutes. But then, everyone’s oven is different. 1. Thaw puff pastry dough according to package instructions, usually 24 hours, left in the box. 2. Preheat an oven to 425°F. Lightly grease a baking sheet. 3. On lightly floured surface, roll out the puff pastry to 1/4-inch thickness and to a 10-by-8-inch rectangle. Place the pastry on the prepared baking sheet. Using a paring knife, score a border 1/2 inch in from the edge of the pastry. Using a fork, prick the center of the pastry. 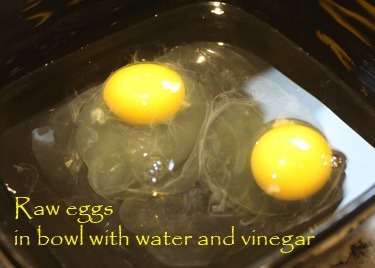 Brush the border with the egg wash and refrigerate for 15 minutes. 4. 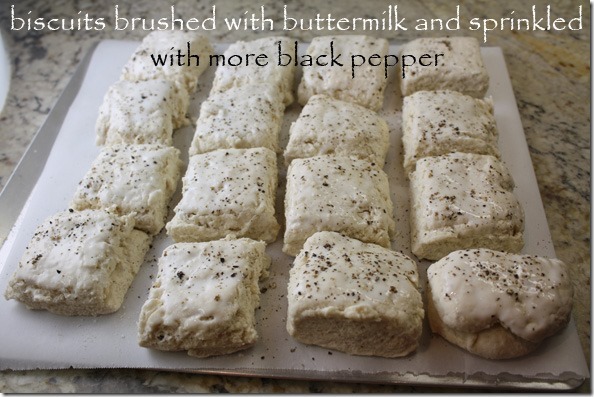 In a small bowl, stir together the crème fraîche and cheese, and season with pepper. The bacon will add enough salt, but you can also sprinkle salt on top at the end. 5. Spread the crème fraîche mixture on the pastry, keeping the border clean. Lay the bacon pieces on top, scattered all over. Bake the tart for 14 minutes, rotating the baking sheet halfway through baking. 6. Remove the baking sheet from the oven and place it on a level heatproof surface. Using a fork, prick any large air pockets in the pastry. Crack the eggs onto the tart, spacing them 2 inches apart. 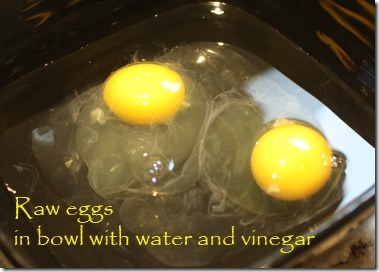 Bake until the egg whites are set and the yolks are still soft, 7 to 10 minutes. 7. 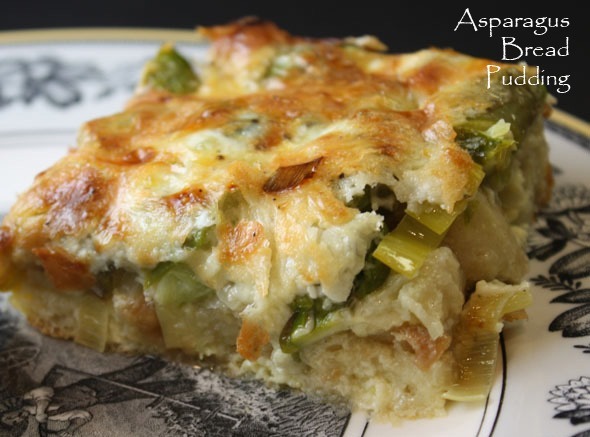 Transfer the tart to a platter, garnish with the chives and serve in irregular pieces so each person is served an egg. 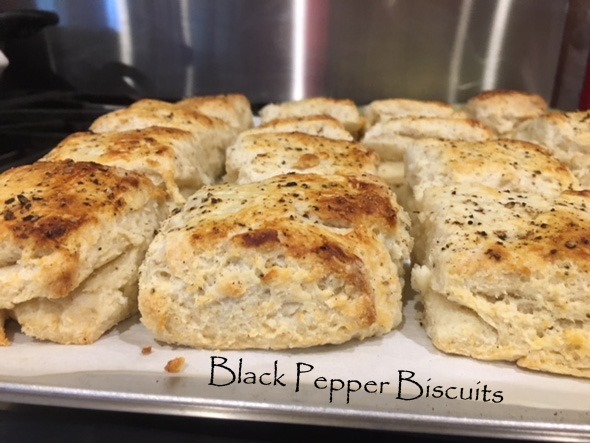 Per Serving: 625 Calories; 47g Fat (67.5% calories from fat); 21g Protein; 29g Carbohydrate; 1g Dietary Fiber; 311mg Cholesterol; 500mg Sodium. Posted in Breads, Brunch, on April 13th, 2018. Lovely, tasty coffeecake with a cinnamon and nut filling, made in a Bundt pan. It’s been years now, I’ve been on a quest. A friend and I went on a Los Angeles gourmet crawl of some kind. It was daytime, and we visited a variety of restaurants and food emporiums. When we paused at a catering place in Santa Monica (I think it was) they served us each a little slice of a Hungarian coffee cake. I was smitten. I asked if they’d share the recipe. Uh, NO. 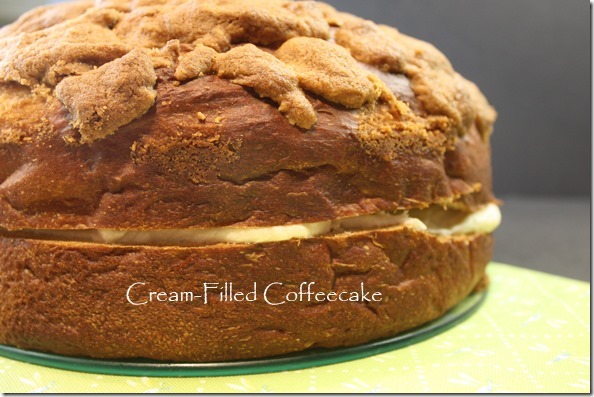 That coffeecake didn’t look like this coffeecake, I’m sorry to say – it was much darker colored batter/cake. 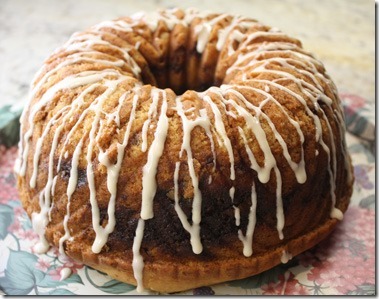 It was made in either a Bundt or a tube pan and it had cinnamon in it, some nuts too. It was just so divine. Ever since (and this has been 25 or more years ago) I’ve looked in cookbooks at the library, on the internet, etc. 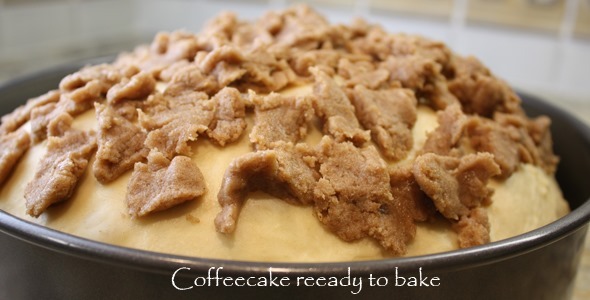 to try to find a recipe for a dark battered coffee cake. But when I looked at THIS recipe I thought well, definitely not a dark batter, but it sounded good nonetheless. The recipe came from Food52, and is credited to Maida Heatter, that diva of all things sweet, and comes from a 1999 cookbook she published. I followed the recipe to a T; however, I’ve made one little change in the directions. When served, as I cut my fork into the cake, it toppled over right where the filling was – because the filling was dry and unto itself. So I’ve added one step – running a knife through the batter and filling layer to help adhere the cake and filling together. Obviously I didn’t do that with the one I made, but it’s such a minor change, you might not even be aware of it. Hopefully, the cake will hold together better. The filling consists of cinnamon, cocoa, nuts, dark brown sugar and some chopped up raisins. 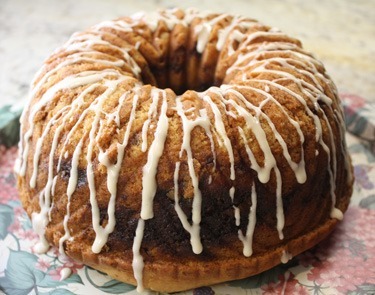 As you layer the sour cream rich batter in the greased Bundt pan, you sprinkle on the filling. Just run your knife through as you add each layer of filling. I didn’t use quite all of the dry filling. 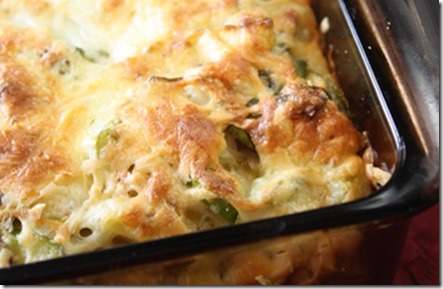 It’s baked for 50-60 minutes (I’d lean toward 60 if you make this yourself). I used the toothpick test, but found when I served it that the cake toward the center was still quite wet – I took my cake out of the oven at 50 minutes. Anyway, the cake is cooled, then plated and drizzled with an easy icing. What’s GOOD: my favorite part was the filling, and the raisins in it. They add a special bit of sweetness. It’s a nice batter – not overly moist, actually, considering there’s 2 cups of sour cream in the batter. 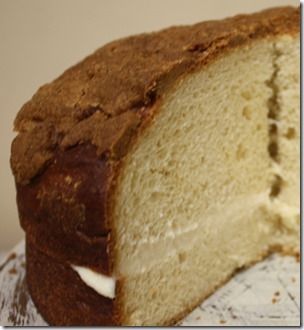 The cake part is relatively nondescript, as it’s the filling that makes it. 1. NUT FILLING: In a small bowl, mix together all of the ingredients. Set aside. 2. CAKE: Preheat the oven to 350° F and butter a 10-inch Bundt pan. 3. Into a large bowl, sift flour, baking soda, baking powder, and salt. Using a paddle attachment of a stand mixer, cream the butter. Add 2 teaspoons of the vanilla and the sugar and beat on medium speed for a minute or two. 4. Add eggs, one at a time, beating each until just incorporated. Scrape down sides of bowl, as necessary, to keep mixture smooth. Beat at high speed until mixture is light and creamy, about 1 minute. 5. Turn mixer to low speed. 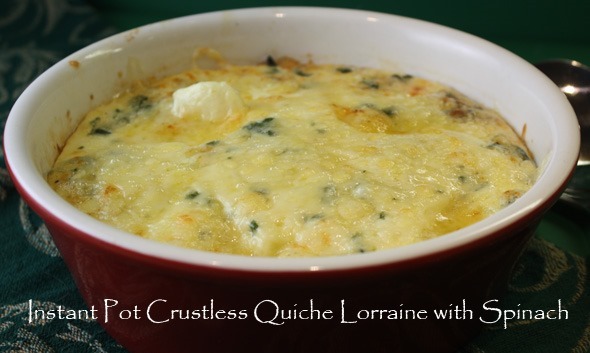 Add dry ingredients in three additions and sour cream in two additions, beating only until smooth after each addition. 6. Spread a thin layer of batter in bottom of prepared pan. Sometimes it’s easier to use a small spoon to drop some batter into pan, and then to smooth it together. Top with 1/3 of nut mixture. Run a knife, zigzagging slightly through the batter. Repeat until you have 4 layers of batter into pan and smooth it together. Use a knife to zigzag once with each layer of filling. Top layer will be batter and it’s not necessary to run the knife through that layer. 7. Bake 50 to 60 minutes, or until cake tester inserted in center of cake comes clean. Remove from oven and cool for 5 minutes, then turn out and re-invert on a rack. 8. Combine confectioners’ sugar, hot milk, and remaining 1 teaspoon vanilla extract in a small bowl. Mix well. Mixture should have the consistency of a thick cream sauce. Place a sheet of wax paper underneath a cooling rack. Pour glaze over cake, letting it run down the sides, while still hot. When glaze is set, transfer cake to a serving plate. Serve cake warm or at room temp. 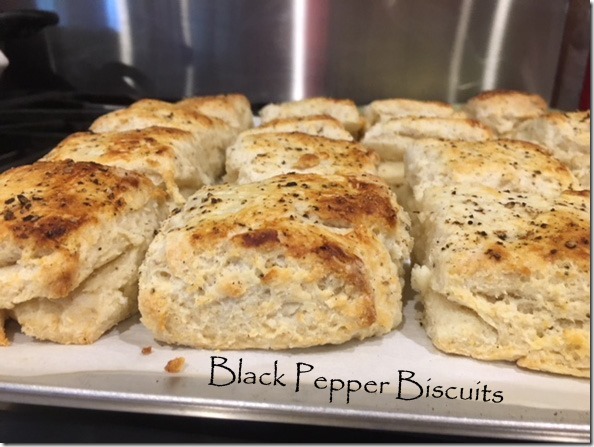 Per Serving: 611 Calories; 27g Fat (39.1% calories from fat); 9g Protein; 86g Carbohydrate; 2g Dietary Fiber; 101mg Cholesterol; 470mg Sodium. Posted in Breads, Brunch, on February 24th, 2018. Oh, dear, do I overuse the word “yummy?” I hope not. This is a time to use the word. I try to use different descriptors for my blog food, so you get a sense of how it tastes. This recipe is a keeper. One of my book groups was meeting here at my house, and I reviewed the book, The Last Midwife, a wonderful historical novel about the 1880s in a small mining town in the Colorado Rockies. About Gracy, an older woman who has been a midwife since she was 10 years old. A crime rocks the town and Gracy is blamed (she isn’t guilty, but only the reader knows that). Currently, the book is written up on my sidebar if you want more info, but it will disappear from there in a month or two as I add newer books to my “currently reading” section. It’s a great book and with lots to talk about – the hardships of mountain, pioneer life. Many interesting characters to discuss too. Anyway, I made this coffeecake for the group, and oh gosh, was it ever good. 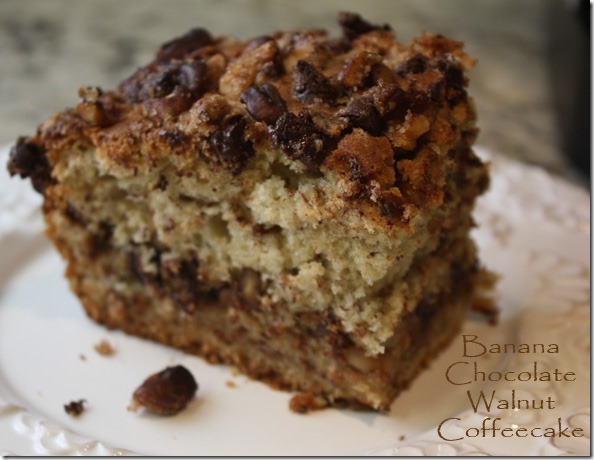 It has 2 banana batter layers and 2 walnut/chocolate layers – as you can kind-a see in the photo. Sorry my photo was a little blurry on the bottom . . .I was in a hurry! It was very easy to make. According to my notes, it was from an old Gourmet magazine back in 2008. The riper the bananas, the better the flavor. Mine weren’t as ripe as I would have liked, but at least they weren’t green! The cake took longer than expected to bake – the recipe said 35-40 minutes, but it took 50 minutes for me. I used my instant read thermometer to make sure – once it reaches 190°F it’s done sufficiently. I let it cool in the pan for about 20 minutes, but then I HAD to cut it into squares to serve it. It was still quite warm, but once out on a pretty platter it cooled enough for everyone to eat. I heard lots of uhmmmms and ahhhs. Including my own murmuring. What’s GOOD: the banana flavor is certainly there. Which is good – it has that kind of speckled look (as in banana bread, you know what I mean). Loved the scent of cinnamon, and the crunchy walnuts and of course, the chocolate, which isn’t predominant, but you definitely know it’s got chocolate in it. Altogether delicious. I’d definitely make it again. What’s NOT: only that you do dirty a few bowls in the making of it. None of the steps is hard or time consuming. 1. Preheat oven to 375°F with rack in middle. Butter a 9-inch square cake pan. Whisk together flour, baking soda, and salt in a medium bowl. Set aside. 2. Beat together softened butter (1 stick) and 3/4 cup sugar in a medium bowl with an electric mixer at medium speed until pale and fluffy, then beat in eggs 1 at a time until blended. Beat in bananas, yogurt, and vanilla (mixture will look curdled). 3. 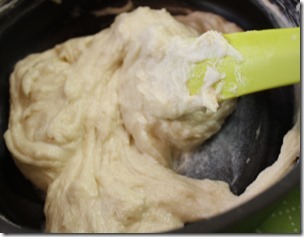 With mixer at low speed, add flour mixture and mix until just incorporated. 4. Toss together chocolate, nuts, cinnamon, melted butter, and remaining 1/4 cup sugar in a small bowl. Spread half of banana batter in cake pan and sprinkle with half of chocolate mixture. Spread remaining batter evenly over filling and sprinkle remaining chocolate mixture on top pressing slightly to adhere the topping to the batter. 5. Bake until cake is golden and a wooden pick inserted in center of cake comes out clean, 40 – 50 minutes or until the cake reaches an internal temp fo 195°F. Cool cake in pan on a rack 30 minutes, then turn out onto rack and cool completely, right side up. 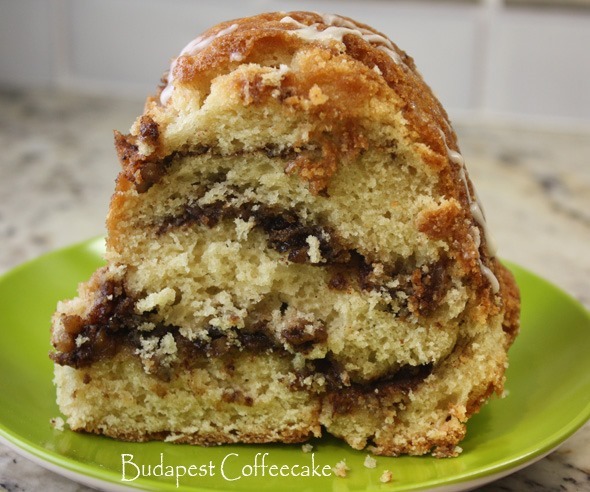 When you upend the coffeecake some of the topping may fall off. Cut into small squares. Per Serving: 391 Calories; 22g Fat (48.7% calories from fat); 8g Protein; 45g Carbohydrate; 3g Dietary Fiber; 63mg Cholesterol; 215mg Sodium. Posted in Brunch, Vegetarian, on October 30th, 2017. So cinchy easy I can’t believe nobody had figured this out before. Subscribing to the posts from Food52 is sometimes daunting. They post about 10+ posts a day. Well, maybe I’m exaggerating, but seems like every time I go to look at what they’ve posted, it can take me an hour to get through them all. Yet I don’t want to not look at them because there are some real gems there. Anyway, since I’ve been having a poached egg or two on toast for dinner now and then (my DH would NOT have thought that was a proper dinner, which is why as a widow, well, I can!). So I had to try this pronto. Since I did two eggs, I used a bowl instead of a mug (recommended). You add about 1/2 cup of tap water, a tiny splash of distilled vinegar, stir it a bit, add the eggs, cover the mug or dish, pop it into the microwave and cook on high. In MY microwave, it takes 90 seconds, but a single egg in a mug will take maybe 45-60 seconds. You’ll have to judge it yourself. The toast needs to be in the toaster before I put the eggs in the microwave and in a jiffy it’s all ready. So VERY easy. If the eggs aren’t quite done, put it back in the microwave and continue for maybe 5-10 seconds until it’s done to your liking. I like a runny egg, so your timing might be different. 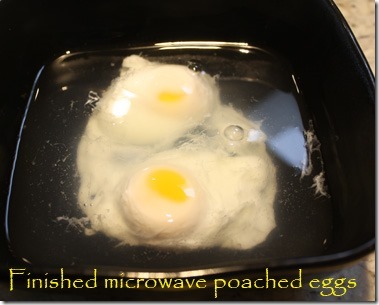 In my microwave, the very tip-top of the egg isn’t submerged. If you want to not see that, remove the bowl/mug after about 45 seconds (once the water is warm) and use a spoon to drizzle some hot water over the top. I’m fine with the little coin of bright yolk on top. What’s nice is that my lunch or dinner is finished in a matter of 2 minutes, tops. What’s GOOD: the speedy meal – the fact that I can have a meal done in a matter of 2-3 minutes. These are every bit as good as ones you’ve done in simmering water, I think. What’s NOT: gee, can’t think of anything. 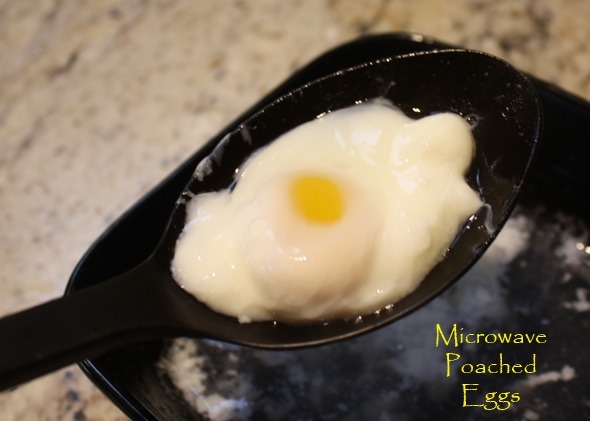 Maybe if you needed to do 6-8 eggs for a family, this wouldn’t work – easier to do a big skillet of them, but for me, this works like a charm! 1. Add water to a mug (or bowl if doing two), stir in half a tablespoon of vinegar, crack an egg into the mug, cover with a top (a plate works) and microwave for 45 seconds. 2. Look to see if it’s done. If not, add another 10-20 seconds and check again. Depending on the voltage of the microwave it could take longer, or shorter time. Drain using a slotted spoon and serve. Per Serving: 74 Calories; 5g Fat (62.1% calories from fat); 6g Protein; 1g Carbohydrate; 0g Dietary Fiber; 212mg Cholesterol; 70mg Sodium.